The last-minute promise of devo-max is probably the main reason for the Scottish No vote. But lots of voters appear to have had doubts about the economy. According to Ashcroft’s post-independence polls, 47% of No voters cited “the risks of independence when it came to things like the currency, EU membership, the economy, jobs, and prices” as the most important reason for rejecting independence, compared with two other choices. Keeping the pound was much more important for unionists than for Yes voters; jobs and prices marginally more so. The Aschroft poll shows that 19% of No voters made their minds up in the last month or later, even if the majority of the anti-independence crowd always knew which way they’d vote. Better Together only needed to implant fear about the economy in some wavering minds at a late stage in order to tip the balance toward the union. I suspect that a more credible economic plan could have swung these no-voters — people who want more fairness and a voice but who were swayed by promises of more powers and were too worried about the economy to vote for full separation. Consider … the economic results of the major “Western” nations that have chosen independence from England: the U.S., Canada, Australia, New Zealand, and Ireland. Each of those nations must be considered among the world’s greatest success stories on economic, political, and social grounds. So risk in itself isn’t at issue. Of course an independent Scotland would face an uncertain future, just as it does now. It was the lack of a credible alternative that really put off potential Yes supporters. One of the victories of the No campaign was its ability to conflate independence with rule by Salmond. The personal unpopularity divisiveness of the First Minister and his dominance of the campaign (maybe the Darling debates weren’t such a good idea) made it easy to gloss over the realities that Scotland would have an election in 2016 to vote in the first Scottish parliament and that the opinion polls at the time predicted a small Labour majority. But given that Salmond was a figurehead, he should have admitted that Scotland probably wouldn’t be the land of whisky and cranachan in the years after independence. Voters were too smart for that. He should have instead acknowledged the short-term difficulties Scotland would undoubtedly face after the election, such as a budget deficit of 5.9% of GDP (even though the budget was in surplus on average from 1980 to 2012) and the restrictions on fiscal policy faced under a currency union or sterlingisation. Salmond and the Yes campaign should have focused more on the long-term possibilities for economic expansion that couldn’t be accommodated within the union. I don’t really know why Salmond refused to be realistic. Perhaps he’s too much the politician, always fearful that the media would seize on any negativity: promise the world and voters will buy half of it. Maybe he was just so blinkered by the proximity of his lifetime goal that he couldn’t even admit to himself that there’d be problems in the early days. Perhaps he was too worried about business, although he shouldn’t have been. Lots of corporate bosses openly supported independence and many understood that an expansionary policy would be good for them because it would boost demand. So it wasn’t risk per se that swung it for the No camp. It was a lack of a believable alternative and the refusal of Salmond to outline a plausible plan for the currency. Scotland could have launched its own currency several years down the line after establishing its creditworthiness. A credible long-term economic alternative has already been outlined by several prominent economists, in the form of expansionary policies aimed at reflating the shrunken economy after seven years of decline and stagnation. Given Salmond’s professed Keynesian leanings, you’d think he would have trumpeted his sensible approach here. In a 2012 lecture he talked about safeguarding capital spending, encouraging investment and creating jobs — all of which would help reduce the deficit as unnecessary benefits payments fell and revenues rose. He rightly cited nationalised Scottish Water as an example of success but criticised the Treasury rules which effectively penalise the Scottish Government if Scottish Water decides to borrow. Salmond talked in expansionary, Keynesian terms of the need to alter taxes so as to boost specific parts of the economy, something which Westminster is not in a position to be able to do. 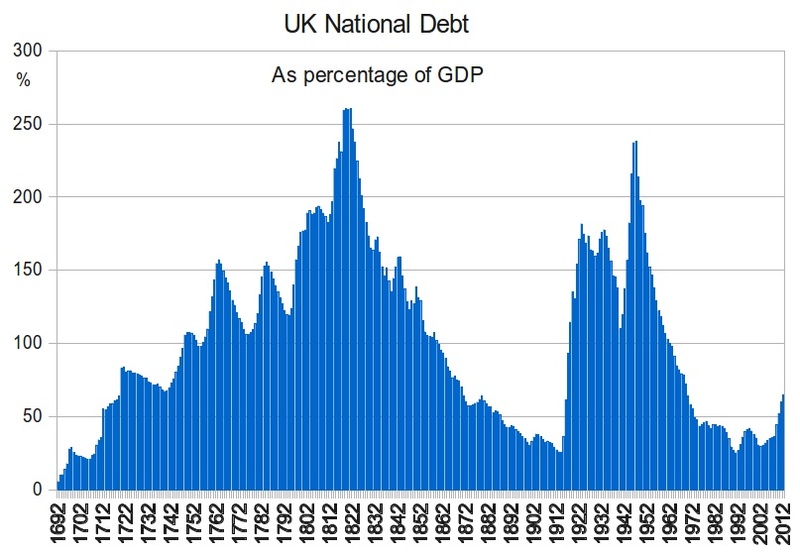 What many people don’t seem to realise, and what the Yes campaign should have hammered home, is that austerity has failed; that the national debt has continued to rise partly because the government withdrew so much money from the economy, shrinking demand. And we’ve mostly bought the lie that the national debt is at historically high levels. Actually it’s about 80% of GDP, much lower than throughout most of history and not particularly large by current global standards. Debt was much higher in the 1930s when Keynes urged governments to spend their way out of recession. Scotland has an opportunity to do things differently to Westminster. What Salmond was perhaps less likely to do from his conventional perspective was to focus on an alternative vision for the future. With a reflated and more stable economy Holyrood could then afford to focus on redistribution and wellbeing rather than simple individual enrichment. Many Scots seem to acknowledge the need for greater equality and environmental sustainability, not to mention an economy that makes them happier. Because that’s what I think the economic debate boiled down to: a short-term beancounter’s approach versus the economics of long-term possibility. Yes, Salmond was very quiet about the post-refenedum World. I am sure that the Scots would have understood if he had explained that there would be challenge and risk that could be overcome with careful economic governance. Independence was never going to be easy.